While airline miles have tapered off, we see that there is nowhere near the drop-off one might expect from a cyclical industry. 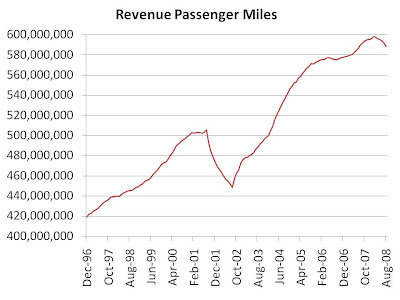 This chart suggests the airline industry is now a relatively stable industry. But that would be an errant conclusion. Part of the reason passenger miles have been stable lies in the exceptional fuel price volatility that has occurred in recent years. As oil prices rose with the economy, growth in miles was tempered by high fuel costs (on the chart we see that miles did not grow much from 2005 to 2007 despite a strong economy). On the flip side, as the economy has tanked, dropping fuel prices have made tickets more affordable. This overall combination has resulted in the seemingly stable demand we see in the chart, when in fact this was caused by exceptional price volatility. Of course, this apparent demand stability doesn't mean that airlines are not currently struggling (in fact, they often will as we discussed here). Value investors, however, should beware. Airlines do not make for safe or fruitful long-term investments, as we discussed here. What a great blog. I have been lurking for the last while and haven't been commenting because I've been busy in the CFA Program. You guys are making me seriously consider applying to Ivey's program. Keep up the good work. Thanks for the kind words, Ali. I also wrote the CFA in Dec! Where did you write it? Good luck with the results! I wrote in Calgary with about 600 others, and you? Before the test, they told us that they had some sort of frequency interceptor to detect if cell phones were on. Ridiculous! I wrote in Vancouver. Ha, they told us something like that too. Thinking of doing a blog post on the sitting in case it helps future candidates, let me know if you suggest anything to include. From The Mailbag: AutoNation Inc.